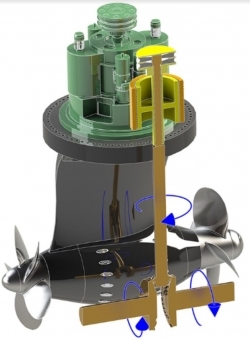 Azimuth propulsion specialist Steerprop has unveiled its new CRP ECO LM propulsor featuring permanent magnet (PM) technology from The Switch. The CRP ECO LM propulsor utilises a vertical PM motor, allowing it to sit inside a vessel hull. When the motor is placed on top of the thruster, the unit size can be more compact. “Steerprop’s contra-rotating propeller (CRP) units are well known for their excellent hydrodynamic efficiency, in some cases delivering up to 25% less fuel consumption than single propeller, traditional electric alternatives,” said Mika Koli, business development manager, The Switch. According to Steerprop, the CRP ECO LM propulsor is “especially suited to harsh-environment operation and the demands of ice breaking, having received the highest ice classification”.